Buddy is a 2 year old Shih-Tzu/Poodle. 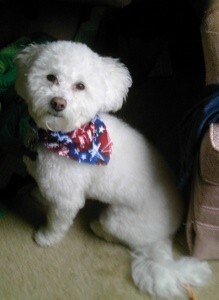 We adopted Buddy from a rescue organization in Algonquin, IL, who had saved his entire litter from a puppy mill. We adopted him when he was ten weeks old, and he weighed less than three pounds. He loves to chase tennis balls and play tug with anything; stuffed animals, rope toys, and socks are his favorites. He is a bit spoiled, he always wants to be in the middle of whatever we are doing and is always up for belly rubs! Snuggling is also a favorite pastime for our two-year-old, twelve pound furbaby. What an adorable little man he is! I just want to reach through the screen and give him a cuddle. But since I can't, please give him one for me.